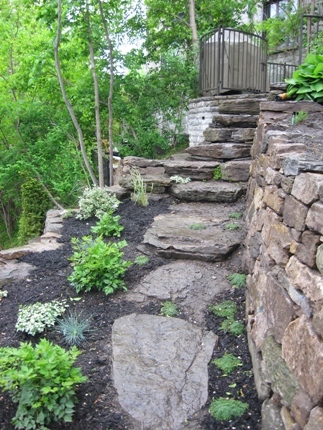 How to Build a Natural Stone Retaining Wall the Right Way! C.R. Stone owns and operates C.R. Stone Enterprises in East-Bolton, a landscape and construction company specialising in natural stone. Built with natural stone from the area. 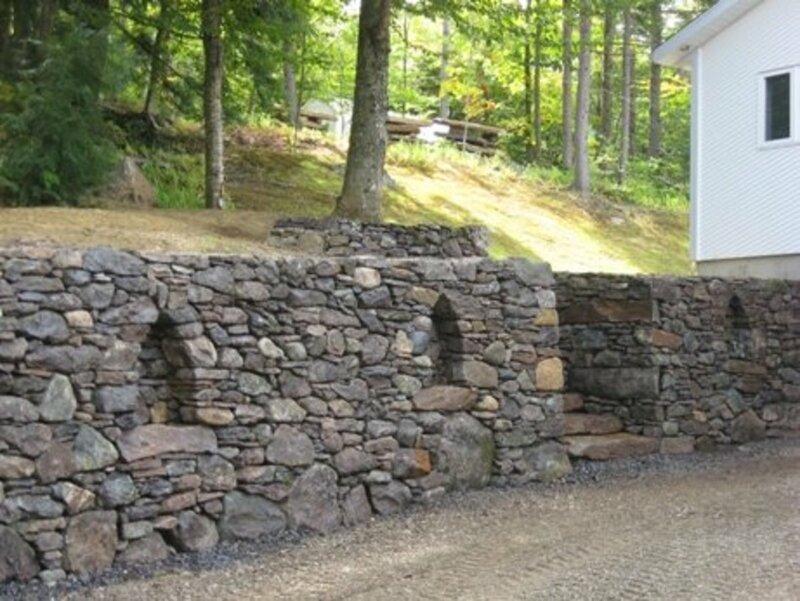 As a landscaper and contractor who has built stone walls and stone creations my whole life (hundreds of thousands of square feet of stonework), and handled over a million pounds of stone (so far), I have found that even some of the educated advice on how to build stone creations is not always accurate. So here are my secrets to building a stone retaining wall. A retaining wall is a special kind of wall, which has to not only support itself but has to actively hold back pressure from the material behind it. Here are some of the most important things to remember when you're building a retaining wall. The rocks you use, however you use them, have to resist the pressure being applied by the weight behind the wall. The weight of the wall will press down on the base material you are building on, which may make the material shift, compromising the structural integrity of your work. Take the time to build a solid base if needed. Water collection behind walls is unacceptable. 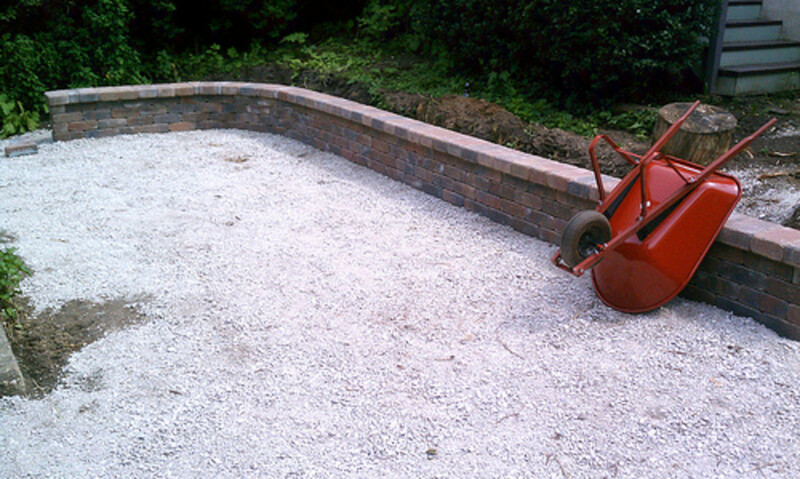 The increased weight of wet gravel or earth, and the high risk of heaving due to frost, can threaten the wall. Thus drainage is important. Any multi-level tiers should be planned out to ensure that the top tiers do not add to the pressure behind the underlying tiers. 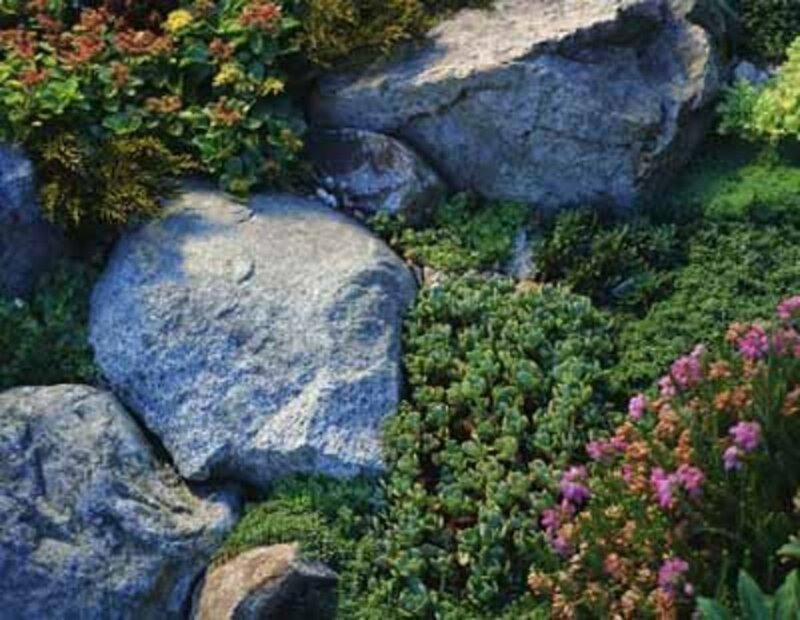 Finally, your wall should be a part of your landscape that marries well with your home, your tastes, and your lifestyle. Remember that the place you first think of for your retaining wall may not be the only place it can go. Moving a wall out a few feet from a bank may allow you to save material, if you can build a shorter wall and keep the same slope or even a more gradual slope in the area behind it. You can compensate by using more fill behind the wall. Once you've got your lines marked out where you want your wall, you have to assess the type of material that will lie beneath it. Gravel will drain, if there is nothing to obstruct the draining process. It should not need much done to it other than a good compacting with a vibrating-plate compactor or jumping jack, depending on the size of wall you're planning to build. If there are areas that will obstruct the drainage, take care of them by laying a perforated drain tile from the low spot that water will pool in--even if the spot isn't visible on the surface--sloping downwards away from your future wall to an area where collected water can flow away freely. You won't want to direct drainage from the wall towards your house; steps were taken when your house was built to gather and evacuate water from the edges of your house, so don't compromise what should work. 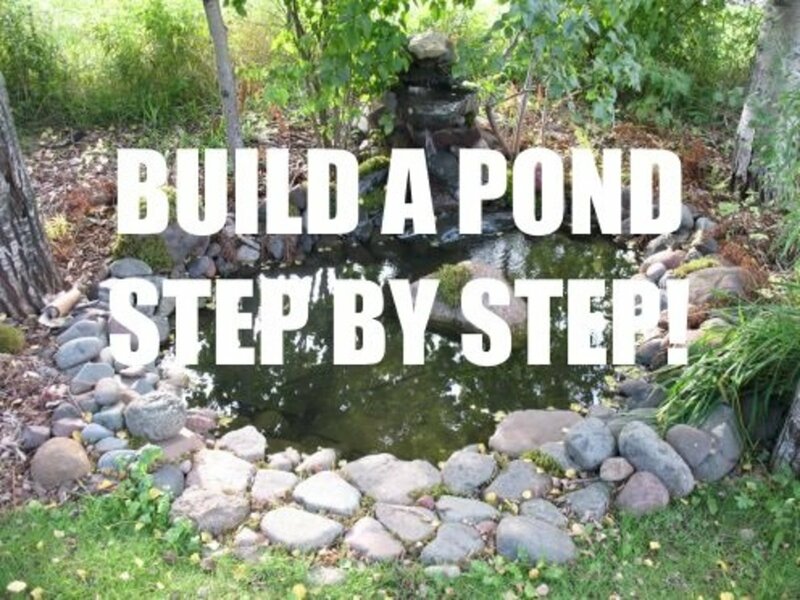 With your gravel base compacted, and potential wet spots taken care of, you're ready to start laying your base rocks. Clay will not drain internally. 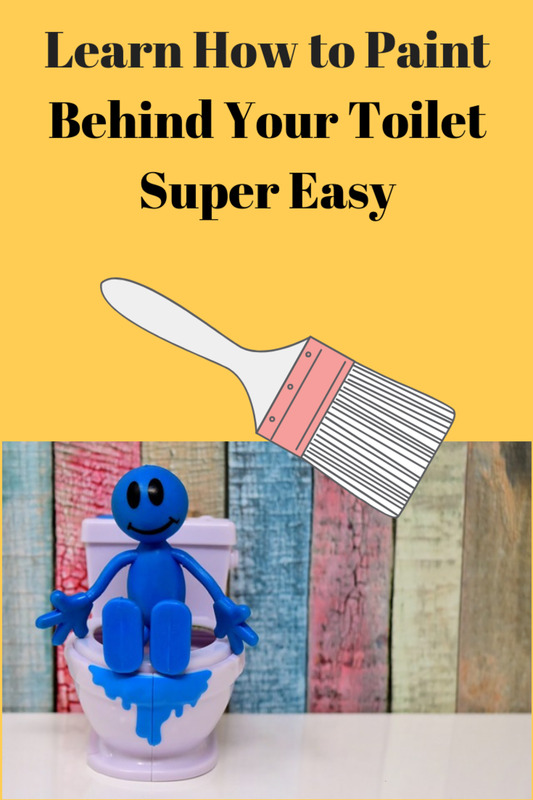 It will need to be either sloped away from the face of your wall so it can drain freely, or sloped to the right or left along the face of your wall so that it may drain past one end. Many landscapers install drains under their walls when clay is found, but this creates an area for water to collect under your wall, which is the last thing you want. But if there is no other way to drain the water that simple sloping methods will collect, you can install a drain behind your wall. Put it far enough behind the wall so that your wall will not be resting on the tile, and slope the base very slightly towards the back of your wall to ensure water makes it to the drain and so that the tile you install will direct the water into some area that will never get restricted. Always take steps to prevent sediment from infiltrating your drain (see below). or if there is mature lawn under the area where the wall will be placed, which has been there for a at least a few years and slopes away from the face of your wall. A well-structured lawn is great at evacuating surface water. However, in most other cases, consider taking steps to ensure that your wall will lie on a solid base. If your wall will be higher than around 24", it will apply a lot of force to the base it lies on, which over the first few years of the wall's life will cause unstable ground to absorb the weight more in some areas and less in others. This will cause your wall to shift or sag and lose its structural integrity. 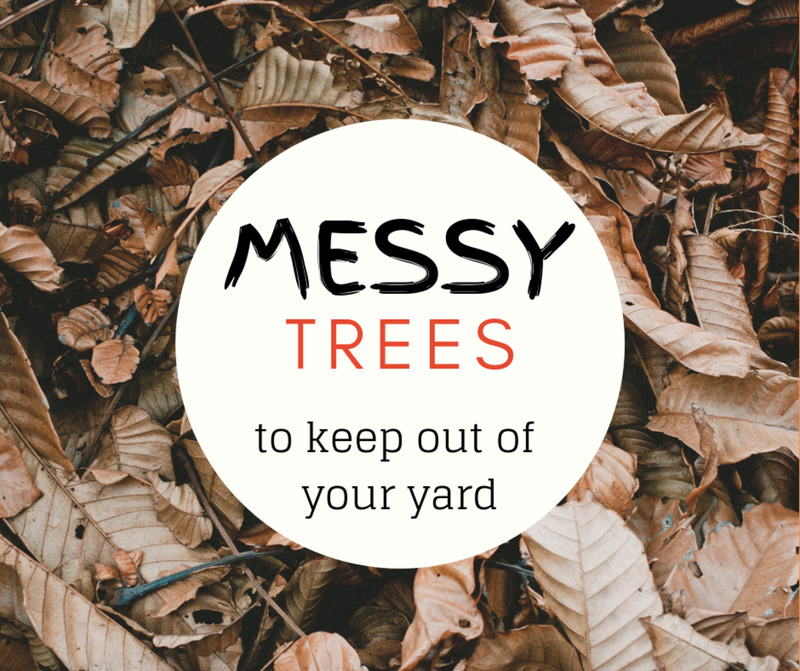 Because of this I suggest de-turfing the area, removing light soil or lawn, and adding "clean" drainage material, that is, material that doesn't include pieces under a given size. 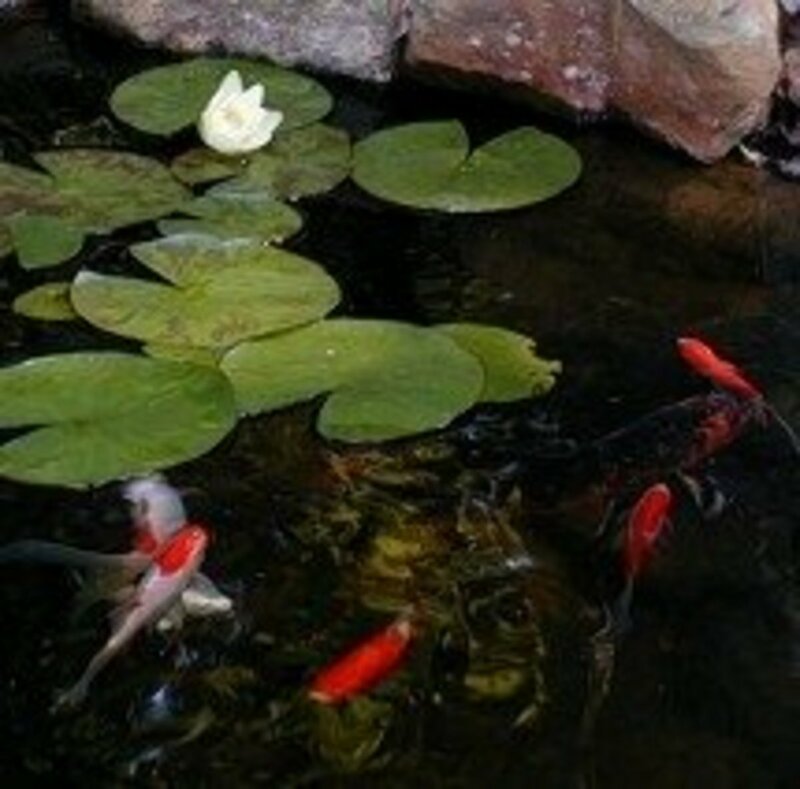 Many other landscapers don't use clean materials, meaning they include sand and silt that can cause clogging. I use "3/4 clean" which has only 3/4" pieces. The problem with material that is not clean is that it creates a false base over your problem area by floating on top of existing materials and sealing them off. Clean material, applied in thin layers and compacted in stages, will be absorbed into the existing materials which lie underneath, adding to their ability to perform as an appropriate base. In most cases when a two inch layer of 3/4" clean material is added to and compacted into an earthy base area, the two inches will easily be driven down into the existing material. Additional 3/4" clean material should then be added and compacted to create at least an additional 2" rise from existing levels in front of the future wall face, to ensure water can evacuate freely. Placing a drainage tile under your wall without complete drain preparation; this allows water to pool if even the smallest shift should occur in underlying terrain and move your wall. Burying your base stones beneath the future levels of your finished landscape terrain; this will definitely allow water to gather around and under your base stones and move your wall. In all cases, you should ensure that your wall will be resting on an area that will be sloping in such a way that water can naturally escape. The face of your wall will have at least 18" of stable ground in front of it. Erosion will eat away at areas of the ground in front of your wall should there be a significant slope. If there is a slope of up to 25 to 30 degrees, you should have 18" of area directly in front of your wall sloping no more than about 10 degrees. On any slope of 30 degrees or more, you should have a couple of feet of strong stable ground in front of your wall if you would like it to last any amount of time. You have to keep in mind that the weight of your wall will be forcing down on its base, and not only straight down, but at an angle up to 45 degrees away from your wall's face. You have to be sure that there is sound material in that area in front of the wall to accept the load. Now you're almost ready to start building. You just have to figure out the height of your wall to determine how wide your base area will need to be. For every foot you plan on going up, you want to build your wall that thick in back. If your wall will be over five feet high, you can most likely get away with keeping a consistent width of four to five feet, if you take care of the way your fill stones behind your wall are placed, and ensure the wall face is sloping inwards at least 2" per foot of rise. However, if you are going to be building an eight- to twelve-foot high wall you're going to want to increase the thickness at the the base to at least six or seven feet keeping it consistent until at least half of your height is reached, and then you can start tapering in towards your face up to a two- to three- foot wide wall at the top. In all cases, the width at the top of your wall should be around two feet, or a little less if planting will be desired. When you draw a side view of your wall, the triangle you are going to create with your wall should be at least the same size as, if not bigger than, the area behind it from the back of the base up. This amount of weight in the structure of your wall, along with a good inward slope and a few laying tricks of the trade, will allow your wall to be able to counteract the pressure from the ground behind it. If you are planning a second tier, you should also draw out where your wall faces and backing will end up, as well as where the upper wall's weight will be distributed in the area below it. For instance, if you have a four-foot wall in front of and below a second wall, and the second wall is only three feet behind the finished face of your first wall, the entire weight of the second wall will be pushing down and out on the center of the first wall, most likely causing its center to bow outwards and eventually crumble. This is because the upper wall is spreading its load over the area at an angle to 45 degrees downwards and outwards from its edges. Your base stones should be your larger stones. They will be bearing the weight of all the other stones above them and behind them. You should also use similarly large stones behind your base, as well as behind the center sections of your wall, to create a stronger wall whose stones are tied into each other. In other words, spread the weight of the stones over each other, so that each one helps hold the others in place. You do have to make sure, however, that all the stones in your wall are laid level. If one stone is laid sloping down towards another, it will be forced down onto it by all the weight placed above it, compromising the entire structural integrity of your wall above that area. Also, a stone used in the face of the the wall, even if it sits flat and level, should not be used if its top surface slopes down towards the front of the wall. The reason is that the stones placed on top of these sloping stones will eventually slide down off the wall. I have repaired many walls where the previous masons laid just one stone whose top surface sloped down; that mistake brought down a complete section of a wall. 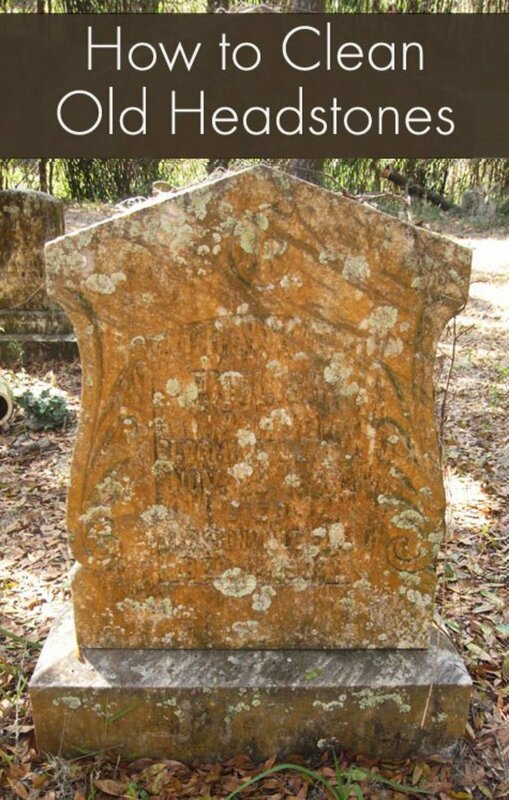 Something similar but not so drastic happens when a stone's top surface slopes too much inwards, towards the back, and other stones are laid on top of it. The top stones will eventually force that wedge-shaped stone outwards, ejecting it from the face of the wall. At best this will leave a hole, and at worst cause the whole wall above the hole to collapse. The trick to getting a wall to last is to tie the stone together, and make sure each stone goes back at least 10" deep into the wall. This is the minimum, and you should help out by adding strong tie stones behind a short stone. Stones will essentially be placed like bricks, in a pattern that ties them together; they are in contact with each other and each is forced downward by the stones laid above it. So if you happen to come across a long narrow stone that has a beautiful face on the long side, don't use the beautiful face on the face of the wall. Unless this stone is as deep as it is long, it's not worth it. Use it as a "tie rock" instead; display the less-appealing small face on the face of the wall, and let the stone's length reach far back into the wall. Used in this way, this stone will tie into more stones around it and be held in place by more stones above it, and guarantee you a wall that will last many years. 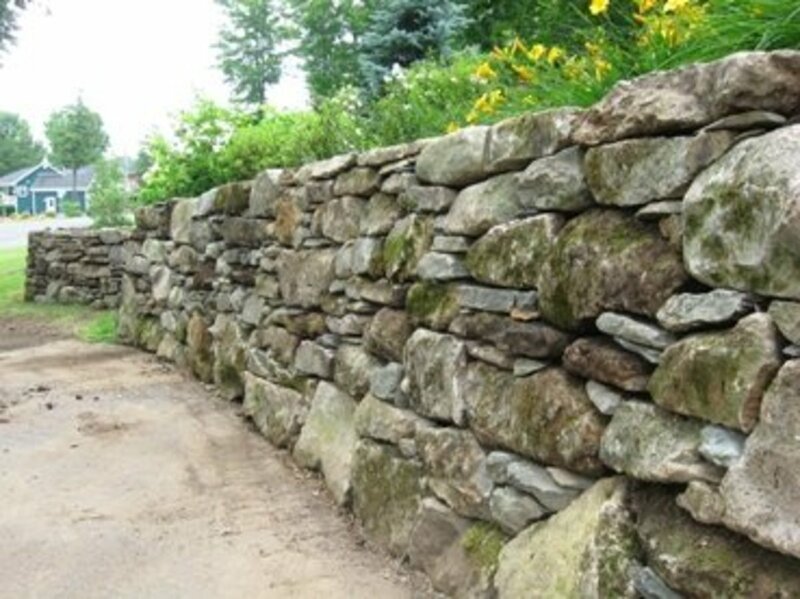 In the Eastern Townships, where I lay wall, many landscapers and stone masons try to save money by laying the longest faces of the stones as facing, to cover more "face footage." When I rebuild these failed attempts at long-lasting walls, I have to bring in more stone to compensate. Knowlton, in Brome Lake, QC, is littered with hundred-year old walls and some dated even further back. My grandfather, his father, and his father's father spent their lives building stone walls, and the one thing that you notice about their walls, is that they lasted and are still around. When helping out my grandfather one day I observed a true test of his wall's strength, and it wasn't meant to be a test at all. When he laid wall, he would pick up great big stones, about 80 to 140 lbs, sometimes bigger, and drop them onto his laid sections of wall where he wanted them to go. If you can drop a 140- lb stone onto any section of the wall that you're building, and not cause any structural damage or movement in the wall beneath, you're on the right path. Remember that the stone you are using has to hold back tons of weight from behind it and on top of it. So a wall built out of five-pound rocks probably won't fare too well over the years if it is of any height at all. Many of my customers in the Bromont area can tell you about a mason in their area who thought he could pull that off. Finally, protect your wall. If you've built a strong wall, there is one last thing that can bring it down: water. Water will definitely end up behind your wall. As long as your backing remains clean of gravel and earth, your wall should fare fine; but if water traveling down and through your wall brings sediment into the wall through the backing, it will do two unwanted things. 1. It will cause instability in the ground above your wall as the ground material leaks out through vacant spaces between your wall's stones. This is especially undesirable if you have additional tiers above, as all the preparation you have done to ensure all areas around your wall are sound will be defeated. Your wall may begin moving inwards into the unstable ground, which is better than outwards, but this may shuffle stones in a way that causes the wall to lose strength. 2. In colder climates, the material that gets deposited into the center of your backing will retain moisture, and as this material freezes it will expand, potentially completely destroying all of your hard work. I have seen this way too many times when the local competition, once again trying to save money on material, backs their walls with gravel or dirt. 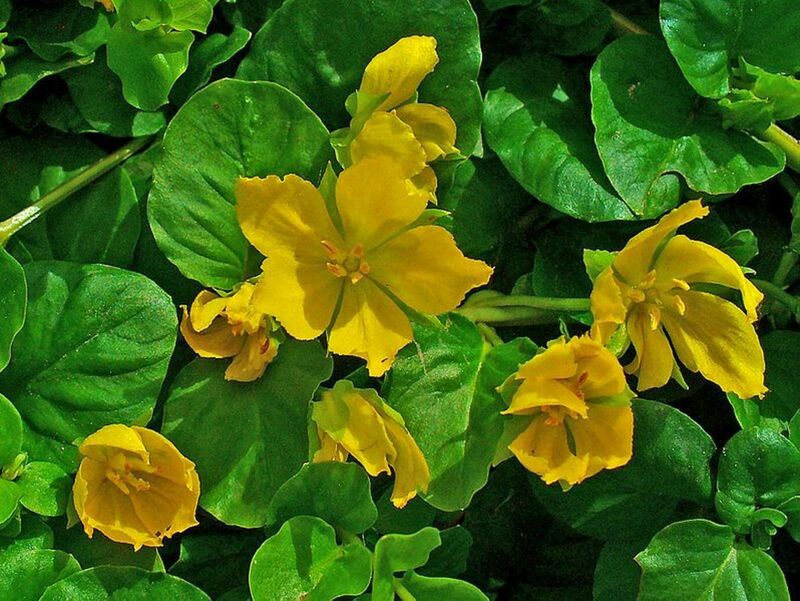 These rarely last a winter without bowing substantially, and quite often simply fall over. In bad cases, a simple rain can cause a wall to crumble when material behind the wall gets too heavy and pushes out on a wall that has been laid too narrow and with no clean backing. So that's the problem, here's the solution: geotextile. Geotextile may be composed of different materials in different regions, but whatever it may be, you need a product with which to completely cover the back side of your wall, a product that will allow water to flow through it freely but will not allow any solid materials to pass through. This will keep your wall and its backing clean, free of material that might disturb the masterpiece you've created. And thinking back to your choice of base preparation, you can now see the importance of getting the water out and away from your wall. A substantial amount of water can collect in the area of your new retaining wall, which now forms part of the drainage system of the area. With this information you can build yourself a great new retaining wall that will last. And remember that a little extra time or money spent the first time around may save you the inconvenience of a needed second attempt. 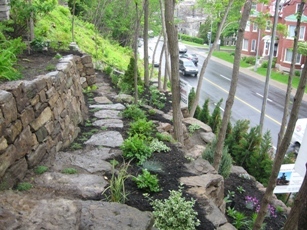 These mossy stones make a new wall in Bromont, QC look as though it has been around for a hundred years. These stones replaced an earlier wall built with stones too small to hold back the bank. The mossy stones make the wall look as though it's been there for years, but with a new clean look from the Penn Blue capping. 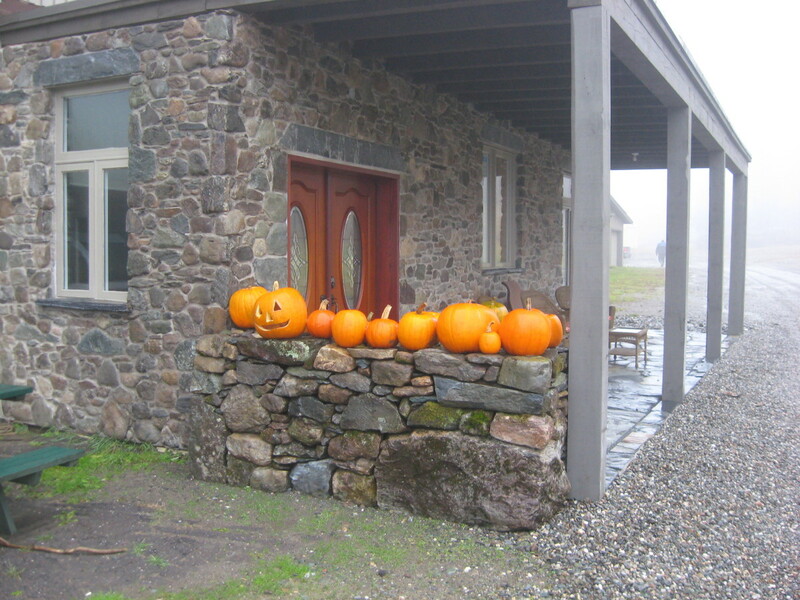 This wall in West-Bolton, near Brome Lake, QC, was built using field stone from the customer's and neighbouring property. Six feet in height and well over a hundred feet long. I was pleased that the customers allowed me to insert some arches. I used the same stones to face this building and to build this little piece of double-faced wall, to ensure that everything looks naturally blended. Sir, I am building an amphitheater for a tribal college in Arizona. The amphitheater has a center ceremonial circle that has a radius of 30 feet, with 3 concentric circles raised 8 inches each with a depth of 8 feet. The first circle will have 10” height stones, the second circle will have mixture of 10” stones and a 6” stone with a 4” stone on top, the third circle all will be 6”s and 4”s. Question: What should we do for a base for the stones? Your article suggests ¾” gravel 2” thick compacted with a plate tamper, then another 2” layer of ¾” gravel. Is that correct? What should we do behind the stones? Geotextile? Then what material ? gravel, AB, Crushed Granite? Should we install a drainage tube behind the stones? After a recent rain the water drained off the circle with no standing water. Thank you for your time and advice. I told you the wrong dimensions It's 110' long and 4'high. I built a summer home in western North Carolina 20 years ago. I unfortunately used railroad ties for the retaining wall and steps. They are now rotting and I need to replace them. My trade was stucco and plaster and after reading your article I can see you know your stuff. I want to do it the right way. My wall is 110', starting at 4' and goes to 10' at the corner and then back down to 4'. I have had contractors for large cement block to large boulders. What would you recommend for this type of wall.? Also what would you estimate a wall like this would cost (ball park) I want to make sure I'm not getting ripped off. Any tips or suggestions would be greatly appreciated. Like I said I want to do it the right way this time. I'm concerned I may loose my covered porches. This was so much more insightful than the average 10 point wiki how to. The depth of your knowledge and experience on this craft is obvious. Thank you for sharing it. Thank you for sharing your hard won secrets. Any pictures of a prepared base would be very helpful for us weekend warriors who really want to do it right. The comments on tieback stones were a revelation. The photos of your finished walls are inspiring... time to go move some stone. Please post pics so that us novice understand accurately and apply technique correctly. Thankyou for your insights on the proper way to make a stone wall. I am surrounded by stone walls here in Italy and need to replace a 1.5 meter tall retainer way because of poor drainage and improper concrete decorative made on top of the stone. I believe this decorative technique of simulating tree branche and bark in cement dated back to 40s or 50s. It has a similar look to the architecture of Gaudi. I plan to remove the building cement to be able to access the stone work behind. This retention wall is only 1.5 meters high and 8-10 meters long and supports three massive cedar trees above. The rooting system is also applying pressure to the wall. I am able to send photos if you dont mind having a look. Your comments would be invaluable.. I am not a landscaper, but I have build numerous retaining walls, single-, double- and triple- tiered, almost exactly as you describe. I have a woodland behind my house there is an old now dry rocky creek bed down a hundred-foot slope in the woods behind my house. I cannot tell you how many boulders I have dug out and rolled, slowly and painstakingly, uphill to where they became retaining walls, steps, terraced tiered sitting walls and stone paths. It has been a twenty year labor of love. Now I am planning to build a three-level terraced retains wall interrupted by stone steps where my back slopes abruptly into the woods. Do I wish you were in my Western Pennsylvania, U.S. neighborhood, because I could use a little expertise and a little more muscle! Incidentally, if you, or anyone wants to invent a fabulous machine for a landscaper, might I suggest a sturdy stainless steel battery powered, self-propelled wheelbarrow. That machine alone, if it existed, would have saved me countless hours of human powered drudgery. I live in old bluestone quarry land with unlimited supply for walls and sculpture. Your writing is clear and fun to read, and I'll benefit from your advice and experience. Hey just wondering if you could give me a few pointers on a wall that I am planning on building. The wall is 1mtr high and runs for 22mtrs. The wall is currently held by a wooden retaining wall but this has been under engineered with small polls so the wall needs replacing. The wall will be holding up our parking area behind our house so we want to make sure that we do the new wall properly and use the correct material. Can you please advise me on the size stone I should be using for this wall. We were considering using 200lb stone but are now thinking that we might need to use 600lb stone and use a machine to lift the stone into place. Do you think that 200lb stone would do the job or are we best to use large 600lb stone for the base layer considering that the wall will have a gravel parking area above it? Also we are planning on using basalt stone for the wall which is very dense and heavy. Do you have any types of stone that you recommend using for stone walls? Wow, these walls are beautiful. Where do you get all the stones? Do you hunt for them or do you buy them from dome type of supplier? I too live in East Bolton, (albeit in the UK) and have found your information both informative and inspiring. 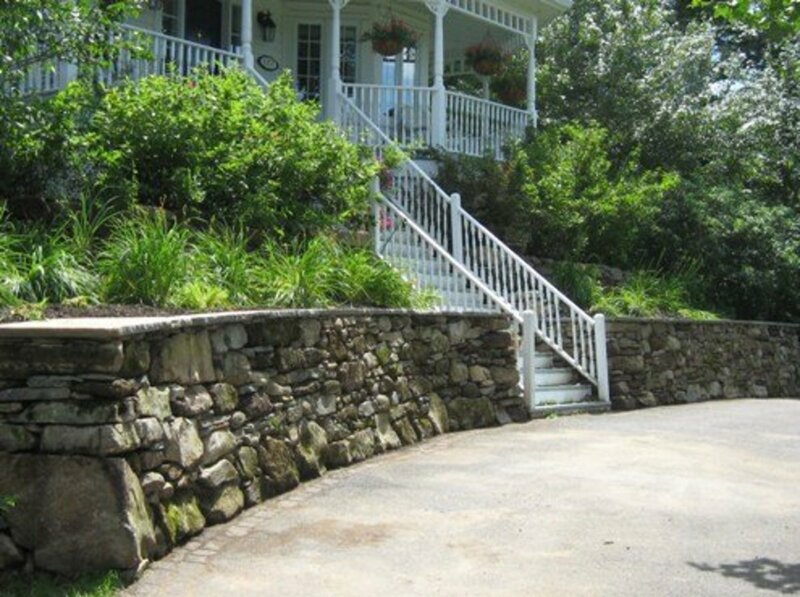 We've thought about having a stone wall added to our landscaping - this is very helpful info! And your stone work is beautiful - thanks for sharing! Your right. Things that last forever take time and money. There's a lot of poor workmanship in today's walls to cater to the client's budgets, but they won't last forever either. its nice to see that there is still some people who like to do things the right way and have pride in there work. with our economy nobody wants to pay to have it done right. Your work is beautiful, and very professional. Excellent hub, and awesome photographs.